Yesterday, about 4:30 p.m., I got an automated message from the Superintendent of Schools in our district. Her voice chirped that there had been an anonymous note delivered to police that threatened elementary schools in our area. I could feel my face blanch and then grow instantly hot as two, tiny, imaginary hands squeezed the backs of my eye sockets making my vision blur. The message said there would be an increased police presence in the schools, and everyone’s safety would be assured. My seven-year-old-son, Jack, is in second grade. I ranted a little about oh the humanity! around the water cooler, then finished my work day and went home. Everyone was there, safe and sound, bickering about not wanting to take showers or eat tater tots and who would get the last cider donut. My husband and I gave each other knowing looks, but didn’t talk about any of this news in front of the children. Many parents have reacted in fear. Local news websites are flooded with people making threats to “get a piece of ’em,” and “this is why the stinking liberals should let us have our guns”, and “there is no way in hell we are sending our kids to school”. It is a mob mentality I understand, but in which I do not want to take part. Everyday, I take an existential leap when I leave the house in the morning. Everyday, I walk a tightrope of faith that everything will be okay when I kiss my son and put him onto the bus. Everyday, I willingly and blindly trust fall into a suspension of reality when I watch my daughter drive off with my husband. I do it, for the most part, without fear. I leap, in fact, without even thinking about it. My legs bend and spring out of pure muscle memory. In other difficult situations, I’ve gotten through it by thinking I’m doing the “right” or “responsible” thing as a mom, as a decent human, as a worker, as a wife, as a part of a family. What is the “right and responsible” thing to do in this situation? Do I send him to school and assume that risk, or do I indulge in the culture of fear and keep him home. This morning, I asked my husband, “Is it okay to feel scared about this?” His yes was resounding. My husband is not an alarmist, still I wondered. It is like my fear sensors are out of whack and I am not certain what is actually scary or threatening to me and mine. I believe this comes from living in a culture of fear, where every minor accident and robbery is broadcast on every news channel, and where gratuitous violence and gore is glorified on TV and movies. It is really hard to stay centered in this kind of situation, to be mindful and to not hop on board the bus of mob mentality which drives the perpetuation of anger, hate, and aggression. Don’t get me wrong, I respect any parent who kept their child home in light of these “threats,” but my husband and I decided to send Jack to school, as per usual. A couple things factored into our decision. My husband pointed out that, probably, the next few days will be the most safe for the children, as security measures are increased. “Whoever did this may be watching to see what the schools do,” my husband pointed out. That is the scary part to me. There are just so many unanswered questions. I also thought about the general safety or danger of the world. If I keep my son home from school today, where does it end? Do I never take him to the mall because it could be attacked? Do I never let him go to school again and homeschool? Do I never take him outside to play for fear the sky could fall on us? As a clinical social worker who works in a very high risk community, I am aware of dangers visited upon children. If not for maintaining a mindful view of all the goodness that balances the world, I would live in perpetual and paralyzing terror. Being informed and educated is different in my mind than getting swept away by all the fear of the unknown. Again, for someone who struggles with situational and anticipatory anxiety, this is easier said than done. It is also a constant struggle not to be overshadowed by the darkness that does exist in the world, and become depressed. My husband and I weighed all of this, then we talked with our little son. We let him know there would be some changes at school over then next few days as they practiced increased safety, “just in case.” There will be some extra police, and it is important to listen to the teachers and principal and do everything they say. He accepted our comments with a casual complaint about having to endure indoor recess over the next couple days. His security and calmness was somehow reassuring to me. In my wildest and worst dreams I never imagined sending a kid to school with all sorts of contingency plans for “just in case.” It sobers and saddens me, but it also makes me realize the insignificance of all the little daily battles like putting on socks, or eating breakfast at the table. I hugged him extra and kissed him all over before putting him on that bus. My heart squeezed tears up to my eyes, but I blinked them back. Rationally, I know he will be safe. But that little primal place at the back of my brain still senses something I can’t quite name. It makes me want to ask what the hell kind of world has this become? May the power of good always shine brighter than any darkness. May love always create safety and peace for the ones we love. May the desire to live in love grow stronger than any that would live in hate and fear. Breathing in, I accept my fear of violence and the unknown. Breathing out, I surround myself and all around me with love, and hope, and peace. How do you stay grounded in the face of fear? What existential leaps will you take today? with authenticity, and a hint of apprehension. so much time away from me. knowing we will not tear. Last year’s first day of school poem can be read here. waved until you were out of sight. until you were out of sight. Then my face fell and they spilled down. and allowed the door to slide shut at your back. as the bus drove off with you. with which I had no idea what to do. We went to our son’s school for Open House earlier this week. I’ve been fighting a gnarly head cold all week, hence my lack of blogging, but I dosed up on Claritin and Tylenol to get in there and sit in that tiny chair behind Jack’s desk. 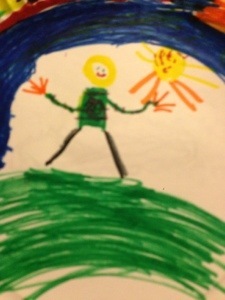 He colored a stunning picture of him playing outside on a sunny day which was left on top of his desk. On its back he wrote a little note welcoming us to his classroom. It turns out that this was the only bright spot of the event. His teacher welcomed us to the first grade classroom by letting us know how busy the kids have been. “I have them on an academic treadmill,” she proclaimed. “I don’t do birthdays. I don’t do holidays. There is not time for me to read to them, and we eat a ‘working snack,'” she continued. She then handed out a packet on the “Common Core Standards” they are enforcing with the kids. She talked for another ten minutes and then “dismissed us.” She did not seem to want any questions. Granted my head was fuzzy from the cold, but I had a hard time processing this information. I wasn’t sure if I was depressed, annoyed, or scared for my kid. It seems they are trying to tighten up academics, teach more, encourage more independence, and create better learners. But is putting our little ones on an “academic treadmill” the best way? Her presentation lacked warmth or empathy. While I understand that in this educational climate she is under the pressure of being responsible for my child’s test scores (and not much more apparently), she did not have the sense of self to know that telling parents you are training their precious children to run like rodents is NOT the most reassuring way to go. 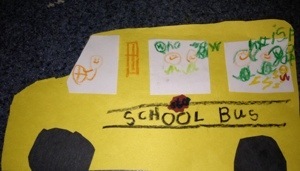 What became clear to me were the reasons for my son’s apprehension about school. He ‘s giving us a hard time in the morning, saying he hates school, he feels sick, and the usual avoidance tactics. We chalked this up to him being bullied in the first weeks of school, but this situation was addressed. We were optomistic things were on the upswing. The other clarification I received was why Jack comes home so agitated in the afternoon- his poor six year old body sits behind that little desk all day while his brain races away and he’s desperate for some physical release! I posted a while back about our struggles with the rigorous expectations of kindergarten. It had been so hard for us to adjust to institutionalized education after our idyllic experience with Jack’s early child care. But at least they had story time and show and tell in kindergarten! My concerns with first grade are the same as they were in kindergarten- that Jack will find education a drudgery as opposed to finding learning is fun and full of opportunities for creativity. It also concerns me that there is no room in this curriculum to teach compassion, which I feel should be mandatory. This is, however, the system we have. I do not have the luxury of sending my child to a private school with a less-traditional approach to learning, nor can I stay home and home school So, I don’t know any other answer than acceptance and hope that it will all be okay in the end. School is different now than when I was small. I find it hard to believe they challenge our little ones with so much academic rigor when developmentally their brains are wired to learn from play and socialization with other children. But this system here and now is all that Jack has known, and I will be enthusiastic and supportive of his education. I will also provide him with opportunities to play, laugh, be creative and wild in the time when he is with me. We signed him up for soccer and karate, both of which he is thrilled with. I hope the physicality of these activities provides balance for him. I’m also making an effort to be a little more laid back with our structure in the home, to be mindful of the fact that Jack has been subject to academic dogma for six hours straight and needs some physical and emotional freedom. I don’t think my kid is any better than anyone else, but he is mine. So you bet your booty I’m going to advocate for him any chance I get, or when I see a need to foster understanding and compassion. I’m also thinking of joining the PTA, because I think maybe getting involved will help temper my fears and anxiety. That night at Open House, my nose was dripping like a faucet and I was dying to get home and commune with my netti pot. So, I left without saying anything to the teacher, which was probably the better choice anyway. As you might imagine, I will be on the lookout for opportunities to help this teacher understand that my son is a sensitive, thoughtful, energetic little human and not a simple mouse who runs blindly away on a treadmill to nowhere. Are you satisfied with the education your child is getting? Have you ever had to advocate for you child at school? Did it make you uncomfortable? What did you do or say? My six year old is being bullied in his second week of school? Aw hell no! Jack brought home a little sticky note from his teacher in his folder last night notifying us he spit at at a peer, and could we please talk to him. It requested that I sign and return the sticky note. My first response was to get sick to my stomach. I had a brief urge to get drunk and jump off a bridge– but unless it was a very small bridge into a heated lazy river, I wasn’t really in the mood for that. As for getting drunk, being hung over with children scampering around is like my worst nightmare, so that was not an option either. That left talking to my kid. Jack did NOT want to talk about it and when I brought it up screamed at me to shut up. This was the final straw. What had I done to bring this monster into my midst who apparently was engaging in primal behavior at school?! I was devastated and also discouraged at Jack’s lack of respect for me. I admit it. I catastrophized. Then the social worker in me remembered the signs and symptoms of bullying- changes in behavior, anger, crying, embarrassment, etc. When we finally got him calmed down (and I got myself calmed too), I laid down in bed with him and talked to him. Because you have to talk to your kid about these things. You can’t run away or jump off anything. School teaches neither compassion nor self defense, so we are responsible for talking to and helping our children solve their problems. We are their Obi Wan Kenobi, their only hope. It turns out there is a kid who Jack has been complaining about since the first day of school, on almost a daily basis. The kid pushed him in the library and has also said some mean things to him. This kid spit at him in the cafeteria and there was no teacher nearby for Jack to turn to, so he spit back. The kid then told on Jack before Jack could tell on him. We explained to Jack that this behavior was totally unacceptable from that kid and from him. We explained that using our words and getting an adult to help is the best course of action. We hugged him and reassured him that we were on his side and that we would figure out how to fix these problems together. This was his first time encountering a really mean kid. Of course he didn’t know what to do. And have you ever been spit at? It has to be one of the most disgusting and shocking forms of aggression, in my humble opinion. I’m not excusing Jack’s behavior, but what the crap??!! This is his second week of first grade!! Why the eff are kids so freaking mean? I’m pissed as hell, which is maybe not the “right” response. Maybe if I called it the Mother Bear Instinct it would sound better. . .
I’m also really sad. It wounds me to the core that my son has been hurt and confused by another child’s cruelty, and that he knew no other way than to respond in kind. And I can’t help but wonder why that other child is so mean in the first place. I do not want to believe that the world is a nasty place, but it truly challenges my faith in humanity to see my own baby in this space. Anger aside, I tried my very best to model tolerance and compassion for James, to not malign the other child involved, and to explain that we always do our best to be kind to others even if they are being mean to us. My husband composed a letter expressing our concerns as well as our desire to work on preventing and addressing such occurances as a team in the future. We Cc’d it to the principal. If I were to look on the bright side, and be ultra-mindful and strength’s based, I would have to say that this presented a good opportunity for us to discuss and model coping skills, compassion, and communication with Jack. Unfortunately, bullies are going to be a part of any child’s experience at school, so it is also important to discuss how to handle those challenging situations. It also presented me with yet another opportunity to check myself and be mindful of my own feelings towards institutional education. As a parent it is hard for me when I have really strong feelings about something, but have to put them aside and put on a bright and positive face for my children. While we hate to make a name for ourselves as the High Maintenance Parents, this is one issue on which we will not stay silent. I am hoping and praying for a positive response from the teacher, and that the bullying will cease. Until then, I will definitely be hugging my kid a little tighter and talking more about the power of love and compassion. Has your child ever been bullied? If so, how did you respond? Were you sucessful? How did bullying affect your child, and how did you help support them? The following link will take you to the Mayo Clinic’s site where you can learn more about bullying and steps to handle bullying. There may also be community groups in your state or area who can help you advocate for your child at the school level, if the school is not suitably responsive to your concerns about your child being bullied.